Have you got a wooden watch yet? No? Why not? If not consider gifting you or your loved one a wooden watch. Watches have evolved from sundials, to pocket watches and more modern wrist watches to smart watches. Wood traditionally has been used in many things, however wooden watches are just a recent iteration. Wooden watches are among the latest fashion trends and are a number of upcoming brands are manufacturing wooden watches. Some of them are low quality and unattractive. We have therefore put together this list of 20 of the best wooden watches that you can find. They are a combination of style, quality and durability. Combined with a good outfit you are sure to get heads turning. They are also among the most eco-friendly watches on the planet! 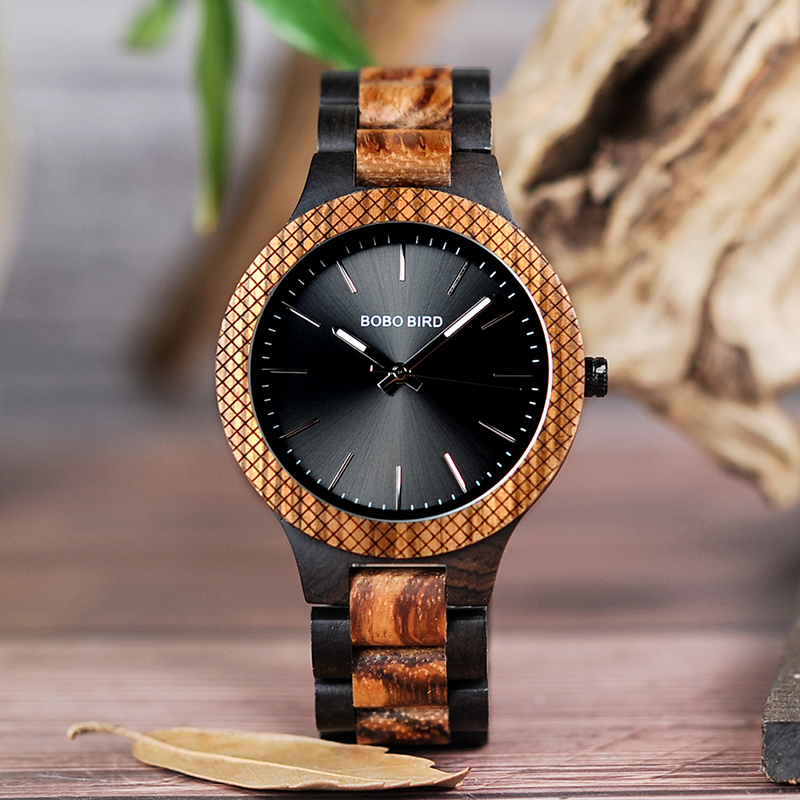 Most wooden watches are made from re-cycled bamboo. These watches are also perfectly suited for people who have sensitive skin and are unable to wear traditional metallic watches. They are also much lighter than metalic watches. If you are a frequent traveller this is a great watch to have. Available in 2 distinct colours black and natural wood. The strap is made of genuine leather extracted from cow hide. The dial has a world map drawn on it. The luminous green stitching on the strap is a great addition to the looks of this watch. It’s great for casual wearing. The watch is water resistant and good for wearing while washing hands or showering. Although swimming is not recommended. The glass on the dial is made of hardlex material which is scratch resistant. Vienzo is a gorgeously hand crafted minimalist style wooden watch. The dial is plain and has no numbers or indicators. The inner part of the crown however has some minute indicators. The second hand is red in colour making a stunning red and black combination on the dial. The band is also made of 100% natural wood. The buckle though is made of stainless steel. If worn with the right outfit this watch is sure to get heads turning and getting you compliments. This watch is also water resistant and the glass is also made of Hardex scratch resistant material. The case uses recycled bamboo wood. This watch’s graceful European design is seen in every detail. Be sure to add the Vienzo to your cart and experience it’s romance. This is one of the first wooden watches to appear on the scene. Also one of the most popular wooden watches. With over 4000+ orders shipped worldwide, it is indeed one of the most popular wooden watch designs. The band and the case are all made of bamboo wood. The minute hand and the hour hand are both luminous making it easy to tell the time at night also. It has a real antique look to it. The watch costs $34.99 that means you can easily purchase the watch without breaking your wallet. The level of detail is what makes this watch so exclusive, even over and above the technical complexity and reliability of this design. Each piece is intended to be tremendously comfortable and visually pleasing. Quartz has a rustic look and is available in seven different colours. The brand is Uwood which is a well established brand in the wooden watches niche. Roman numbers on the dial give it a mediaval look. The case and the strap are both made of natural wood. It is also using a miyota movement which is among the most durable watch movements to date. Battery life can easily be 1 – 2 years so no need to worry about changing the battery any time soon. Maple is a hand made wooden watch with a dial diameter of 4.4cm, case thickness of 1.2cm, band length of 24cm and band width of 2.4cm. The polished black and natural wooden colour combination is spectacular. The face is constructed of maple wood whereas the border and wristband are made from zebrawood. The quality of this watch is unmatched by any other. Another wooden watch offering a combination of wood and leather. The leather is made from genuine cow hide. The dial has natural wood markings giving it a great look. The face of the watch features a uncluttered design, with analog markings that strike a balance between earthy and classy. The combination of white and red on the hands is splendid. The watch has a pin buckle clasp. The dial glass however is plastic. So it is a little prone to scratching easily. The back of the dial is also made from wood. This is the perfect watch for people with sensitive skin. The watch comes in 2 distinct colours. One with a black face and another with a brown face. The watch has a design the focuses environmental consciousness. It doesn’t fall short on features either as it has both a day and date display. The case is made of Zebra wood and Ebony. It has a buckle clasp. Weighing only 51g you will not even notice you are wearing a watch. The watch also comes with a wooden box that adds to it’s elegance and makes it easy to store the watch. The watch is durable with a 5 year battery life. The wood textures and colours also tend to get better with time. For flawless accuracy, the watch shows off it’s unique mechanical movement. Forward looking and innovative, this watch catches eyes from across the room. Yet it maintains an natural and classic style.The Watch was designed over the last 18 months and underwent rigorous analysis and improvements. We’re finally ready to bring it to you. This is available in five dazzling colour finishes, furnished with fine materials and gorgeous metals.This is a really unique addition to this list. Wooden watches mostly are operated on battery. This one has an automatic citizen movement. Mechanical watches such as this one are powered by kinetic energy, meaning you do not need a battery or have to go through the hustle of changing the battery after a few years. Just keep wearing the watch and it will keep time. It is one of the most beautifully crafted watches that you will come accross. It has a buck clasp, stainless steel dial cover, a wooden bezel and a leather strap. The watch is water resistant. The dial glass is made of Hardex scratch resistant material. The watch is really an art piece given that mechanical wooden watches are a hard to come by. A skeleton wooden watch that is as elegant as a chesterfield. This is true nature meeting style. The colour of the wood improves with time, ageing just like fine wine. Modern, sleek, vintage, natural, eco-friendly a combination that you will not get in any other watch. A truly unique design in the wooden watch arena. The leather band is complimented by a traditional belt buckle clasp. Be sure to add Deer Buck to your collection. Click add to cart and we’ll rush your watch to you. Free international shipping is included. Are you an environmentally conscious Star Trek fan? You will definitely love this watch then. The watch is made of natural bamboo and genuine leather. It uses a pin buckle strap and weighs about 30g. Extremely comfortable to wear for everyday use. Currently on sale for just $29.99 instead of the regular price of $39.99 Grab one now before the sale ends. Only one word for this watch, “Art Piece” A well-priced and eco-friendly watch, the Sandania is stylishly handcrafted incorporating a vintage design. It’s a truly timeless look, emphasizing nature and sophistication. If you are looking to make a statement this is the watch to get. The picture does no justice. Ultra thin, ultra sleek. Add a new dimension to your watch collection with the Sandania. The watch sets a new standard in comfort and style. Its Japanese quartz movement is reliable and engineered to give you years of trouble free wear. The crystal is the innovative Hardlex Glass; originally manufactured by Seiko, the Hardlex is highly resistant to knocks and scratching and typically weighs less than older watch glasses. Many brands of wooden watches are focusing on men. There are very few wooden watches available for women in comparison with what the market offers for men. Wooden watches for women generally have a smaller dial and a smaller strap. They are also more colourful and more ornaments such as beads are used. No list can be comprehensive enough, we have done our best to pick the watches that are easily available, not too expensive, don’t compromise on quality and are still fashionable. Thank you Erica for the wonderful review. The watch’s design is a really way addition. Many wood watch designs are getting monotonous and the sandalwood white is a real innovation. It comes in 2 unique colours, natural wood and maroon both when combined with the white number markings make a stunning combination. The watch’s face, back and strap are all made of wood. It uses a clasp buckle and the watch is water resistant. How could we combine a list of wooden watches for women without getting a little colourful. Neon is amongst our best sellers. The strap and the dial are sky blue while the face of the watch is a natural wooden colour. The watch uses a pin buckle strap. Sky blue is as famous as it gets for women. Usually makes a stunning combination with a pink outfit. It’s great for wearing with a casual dress. When combined with the right outfit the watch is sure to make you stand out. Roses are red, violets are blue, wooden watches are made for you. Our list of wooden watches for women will keep getting colourful. The itself has no markings on it but the head of the watch has roses printed to help you tell the time. The strap of the watch also has roses printed on it. The watch is completely made of wood except for the clasp which is stainless steel. A two year guarantee will keep this ticking as long as you need. A real beauty to look at the watch is a perfect gift for your girlfriend or wife. A minimalism design makes a brave statement. From its super thin (10mm) case to its relaxed fit, Ciceria has been designed to provide accurate timekeeping. Red is almost a neutral colour for women. It can be combined with so many different outfits. The face of the watch features a circular minimalist design. The strap is made of genuine leather and has a bright red colour. There is no logo on the watch, some brands make their logo really stand out on the watch’s face which can be annoying sometimes. This watch captures the essence of simplicity, but still manages to look great. If you are into art then this watch is for you. It is just as elegant as other watches mentioned here and has a real unique look. The paint used on this watch is free of chemicals and toxins, making it a great buy for people with sensitive skin. To top it off, the glass is made of scratch-proof minerals. How could a women’s list be complete without mentioning pink. The watch does a great job of combining elegance with nature. The watch is lightweight and comfortable to wear given it’s leather straps. The watch is made from recycled bamboo and not zebra wood. The pin buckle means you can easily adjust it to fit your hand. Also offers a minimalist design. It would be great to see this watch and design be available in other colours. Currently it’s only available in pink. Totally unique. Our designers put together in this Watch immense care and attention. Gaze at the subtle combination of zebra wood and sandalwood. It is among the first wooden watches to use different types of wood in the same watch. The black dial and natural wooden face of the watch are dazzling to look at. The watch is designed in Milan, known for its fashion and good taste. The dauphine hands are accommodated behind a sapphire crystal glass. Its Japanese automatic movement is both accurate and trouble free. The stainless clasp and wooden band is comfy enough to wear. They say save the best for the last. Our top selling wooden watch for women is Tamara. It’s a great watch for those who want a wooden watch with a modern and stylish look. Given all the different colours of beads used on the dial in combination with the white strap, the watch is sure to match any of your outfits. The head of the watch is wood, the back is stainless steel though and the band is leather. It also has a Japanese quartz movement for accuracy. It’s great for both casual and official wear. Designed in Paris, it features eternal style, gorgeous jewels and a unique look-through window. At the same time, this watch states simplicity, classiness and heaps of elegance. The production of the watch is limited and the owners can exclusively show off their time pieces. Nearly every person who reviews this watch seems to absolutely love it.